Heavyweight contender Manuel Charr’s campaigning for a fight against former WBA heavyweight champion David Haye (26-2, 24 KO’s) has paid off, as the two fighters will be facing each other on June 29th in the Manchester Arena in Manchester, UK. There will be a press conference to announce the fight this Wednesday. The fight will be shown Sky Sports. 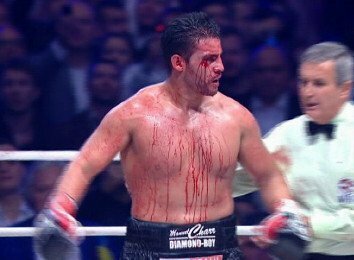 Charr (23-1, 13 KO’s) has only been beaten once in his career in losing to WBC heavyweight champion Vitali Klitschko last year by a 4th round TKO. However, Charr also has had it pretty easy in terms of opposition. There’s his one fight against Vitali, and the rest of Charr’s opponents have been mediocre at best. Is it an accident that Charr has been brought along so carefully by his promoters? No, I think it’s the norm in the heavyweight division nowadays. The promoters match their heavyweights against fluff until they get them a title shot. As soon as they lose, they’re put back on a diet of more fluff until they get another title shot in two or three years. Haye is a perfect example of that. He fought lower level heavyweights to get a title shot against Nikolay Valuev, and then after barely beating him, Haye took too easy fights against John Ruiz and Audley Harrison before getting beaten by Wladimir Klitschko in a unification bout. Since then, Haye has fought only once, beating domestic level fighter Dereck Chisora. Charr has won his last two fights since his defeat at the hands of Vitali, beating Konstantin Airich and Yakup Saglam by early knockouts. Haye should have it really easy against Charr because the fight is such a mismatch on paper. In the past, Charr has struggled to beat the likes of journeyman heavyweights Danny Williams and Zack Page. I had Page beating Charr, but I wasn’t surprised when the German-based Charr won the fight, which took place in Germany. The sad part about the Haye-Charr fight is that if Haye wins this fight, he’ll likely be installed as Wladimir Klitschko’s mandatory challenger. As such, we’ll be seeing another mismatch between Haye and Wladimir, and all Haye would have had to do to get the rematch was beat Charr and Dereck Chsiora. Now that’ sad.